Madison Optimist Club President Scott Piro presented $150 grants to nearly a dozen school organizations in Madison. Very generous of the service club to reach out to our schools. 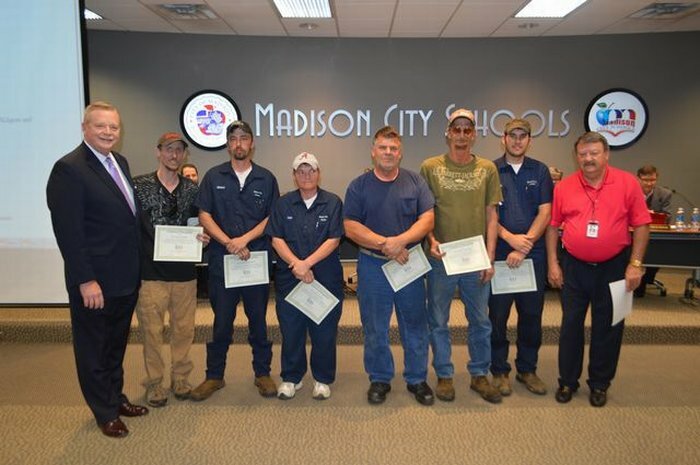 The grants were awarded at the July 12 Board of Education. The grants will be put to good use. 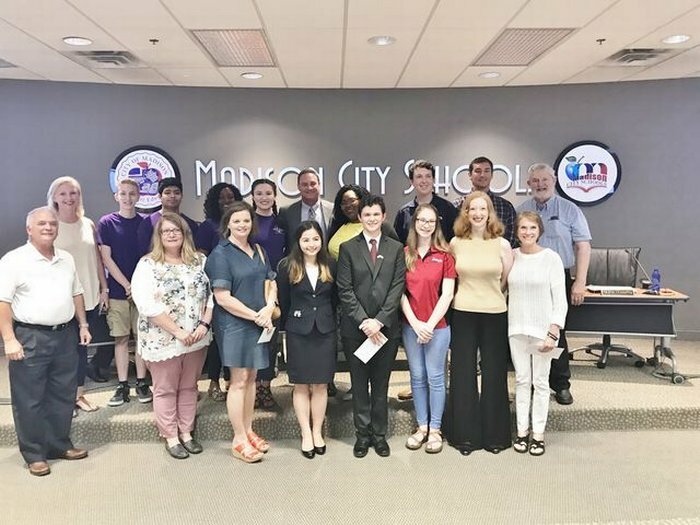 The grants are as follows: Discovery Library Media Center, BJ Patriot Racing, Discovery Kindness Society, Fellowship of Christian Athletes, JC Spanish Club; BJ Health Occupation Science, Madison City Pre-K, BJ Scholars Bowl, West Madison Math Club, BJ Counseling Center, JC Student 2 Student. 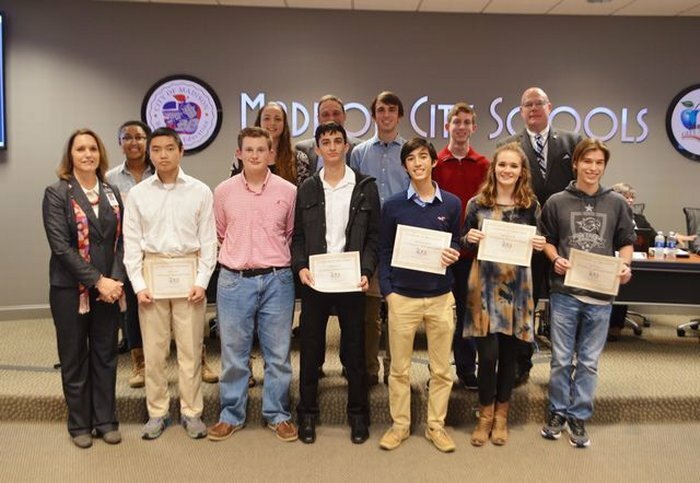 Madison City Schools produced the most National Merit Semifinalists for 2017 of all Alabama school districts, regardless of size. Bob Jones and James Clemens produced 10 each. The BJHS students are: Warren He, Ahmad Imam, Alan Grissom, Michaela Philip, Keona Banks, Heesun Yoon, Shantanu Kadam, Colby Huskey, Dylan Meyer, Claire Magnuson. 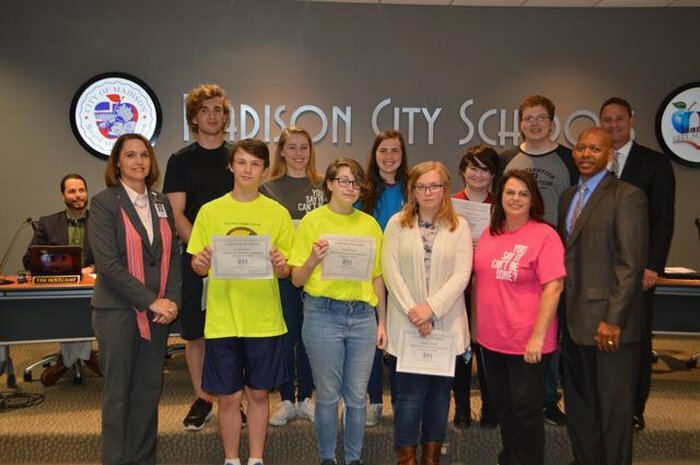 JCHS students are: Christian Burks, Gautham Gorti, James Marden, Sharath Narayan, Kyle Perkinson, Madison Scott, Chad Sykes, Alex Walbom, Abby Woods, Grace Billman. 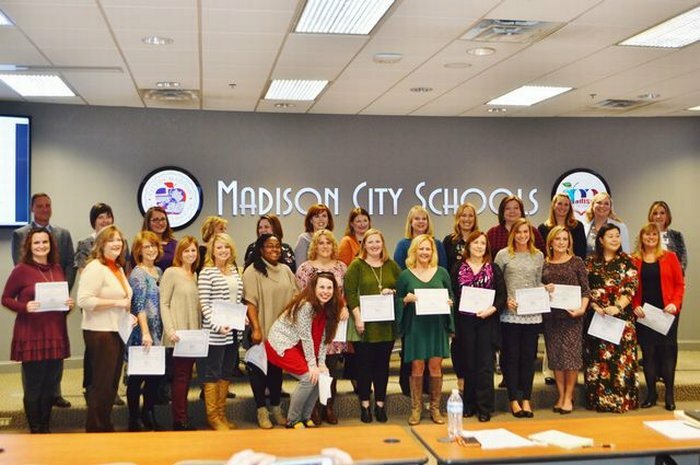 Madison City Schools honored its most recent National Board Certified Teachers at a Board of Education meeting:Ashley, Gina; Bero, Beth; Breeden, Michelle; Elegante, Daniel; Evans, Amanda; Gibbs, Rachel; Haithcock, Jane; Harris, Sharon; Huskey, Cindy; Johnson, Ambra; Jones, Jodi; Jump, Karen; King, Missy; Kuenzli, Megan; Lakso, Robin; Maynard, Susan; Nguyen, Stephanie; Odom, Tabitha; Panagos, Brandy; Protos, Amy; Scott, Deborah; Sedberry, Leslie; Smith, Jackie; Smoak, Natalie; Synder, Lisa; Tibbs, Wendy; Wells, Adrian. State Championship Team members 2017: In no particular order: Jenny Baldwin, Ginny Genge, Megan Lamps, Ben Meyer, Jessie Sloan, Ella Waddell on "The Nest" - Technical Challenge. Jazi Atassi, Lily Bowerman, Paige Bounds, Turner Dauma, Carsten Grove, Jessica Hall on "Feminine Anemone Enemy" Fine Arts Challenge. Caeden Anderson, Jake Munson, Rishish Narahari, Cooper Sawyer on "Rock Bottom Carpets" Improve Challenge. DMS team "Magical Four-Eyed Snapple Caps - Fine Arts Challenge: Avery Adams, Marcus Cutler, Brooke Heath, Rebecca Meyer, Grant Pethel. 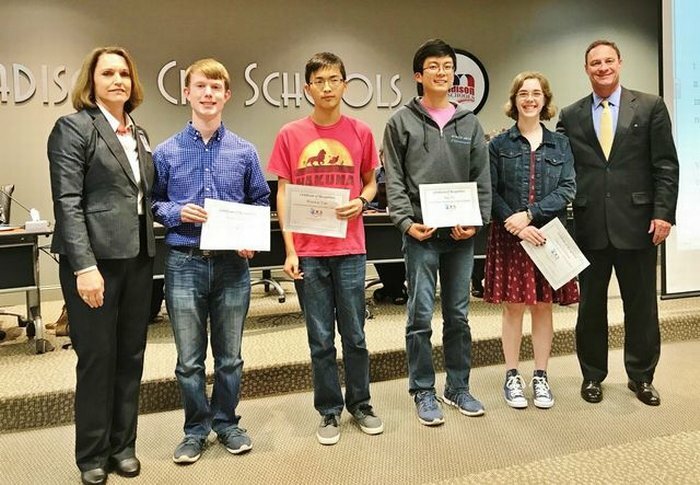 U.S. Presidential Scholar candidates from Bob Jones High School were recognized at the April 20 Board meeting. 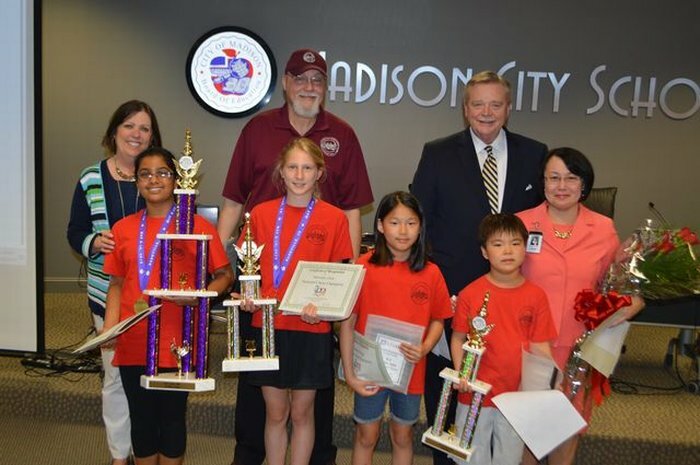 Pictured L-R: Principal Sylvia Lambert, Joshua Todd, Winston Van, Joey Li, Amelia Goldston, Madison City Schools Superintendent Robby Parker. 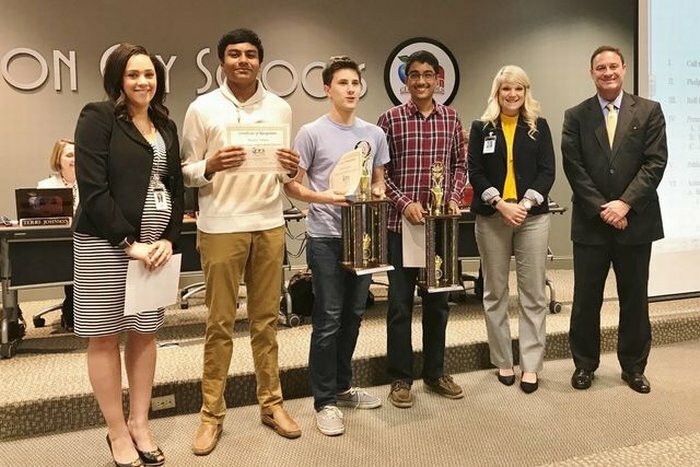 Students recognized at the April 20 board meeting for winning the state championship in the Alabama Scholars Bowl competition: Pictured (L-R) Coach Tiffany Hamilton, Souren Atluri, Nick Southern, Sharath Narayan, JCHS Assistant Principal Jennifer Flanagan, Madison City Schools Superintendent Robby Parker. L-R: Dr. Fowler, Jimmy Perdue, Michael Campbell, Angie Carden, foreman Shannon Pease, Dennis Etheridge, Patrick Woods, Transportation Director Bobby Jackson. The department won a top safety award from the Alabama Department of Education for very few deficiencies found in state safety inspections of the school district's 84-bus fleet. 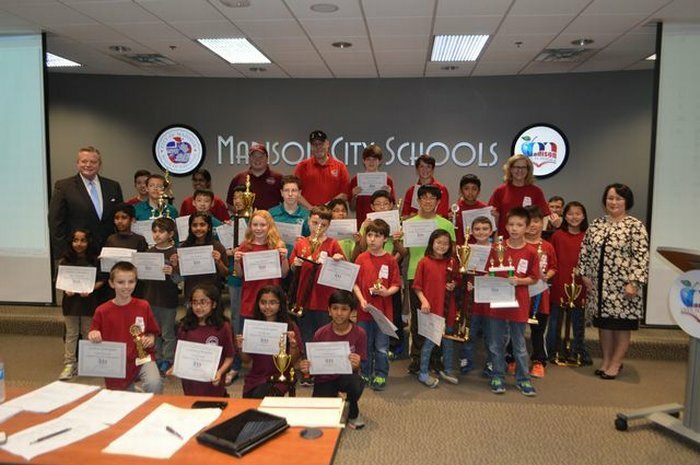 A final group photo of Madison City chess players and teams honored by the MCS Board of Education at the March 24 meeting.